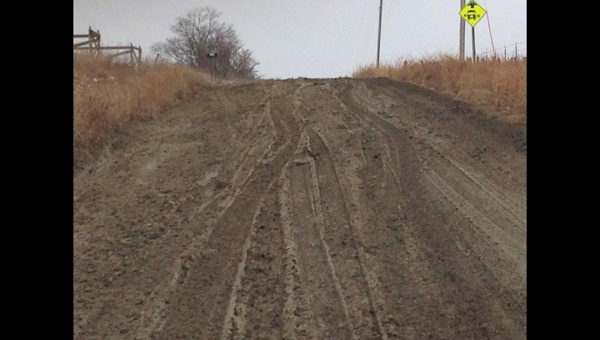 Marion County township roads are in crisis—and have been for many years—but in recent months, frustrated producers are either paying property taxes under protest or turning to another department to be heard. But, whatever the combination of actions by land­owners has been, the Marion County commissioners are listening, and in doing so, approved advertising for the hiring of a county engineer at the Jan. 22 meeting. Not many details were made available at Monday’s meeting, but the vote was unanimous to begin the search. In early January, Lisa Reeder, county appraiser, informed commissioners that about 40 landowners either wanted adjustments on their taxes or wanted her to see firsthand what their frustration is all about. The reasoning for this was that it would free up time for county employees to work on road improvement, she said. The other suggestion was to better train the road graders and increase their salaries accordingly. “He said he also feels that the [road and bridge] department may be short staffed for the projects that are needed. As way of introduction, Carl Taylor, chief executive officer, and Joy Waldbauer, licensed clinical social worker, both with Restoration Center Inc., talked about the treatment program in Marion County. The facility is at 125 E. Main St., Marion, and is accessible to anyone in need of treatment, said Waldbauer. Taylor, who is in Junction City, said the Marion center offers drug and alcohol assessments, evaluations and treatment, along with mental health evaluations. The Marion location is an outpatient facility, said Waldbauer, and is open Mondays, Wednesdays and Fridays. Taylor said the center helps those with drug and alcohol issues to work through their problems, and helps them with goal-setting. Taylor said the reason for introducing themselves to the commission was in letting them know their mission and to include the center when the time comes to review funding. Commission Chairman Kent Becker said the county does see the importance of drug and alcohol programs and the need for them. For more information about the program, call 785-223-2094 or in Junction City, 785-762-4470. Nancy Marr spoke with commissioners about the Marion County Poor Farm being used as one tool for economic development. She reviewed the historical background of the three-story limestone structure built in the late 1880; the farm is about seven miles southwest of Marion. Prior to Marr and her husband buying the old mansion for use as their home, she said it changed hands many times. At one point, she said, there was a lot of vandalism, and the sheriff at that time suggested she move to a more suitable place. Among the many items she brought to the commission, she said she ran across a letter dated Sept. 8, 2014, from a photographer who she said was a fan. “I think the [farm] can be used for economic development along with places like the Chisholm Trail, Santa Fe Trail, the Adobe Museum and Florence Museum,” she said. ◼ provided Robert Harris, Florence Historical Society, with information about preparing a quit claim deed for the land at the Florence Museum. Marion City Administrator Roger Holter administers the Marion Land Bank and would help in deeding the property to the land bank. ◼ heard from Jeannine Bateman, county treasurer, about the policy for taxpayers who pay taxes late. ◼ approved Sheriff Rob Craft’s request for two more full-time people. Craft said one is going to be on military leave for the next seven to eight months and the other will be in school to become a certified officer.